Cats love to play and finding them the best play toy is crucial if you want to save your furniture from being scratched. Cat trees are a popular choice when it comes to cats as they provide endless hours of fun, and something to keep them occupied. Not only do they provide fun but also exercise at the same time as cats can climb them, which is especially good for indoor cats. With so many different types of cat trees out there, it can often be tough finding the perfect one for your cat or kitten. In this article, we will take a look at 3 of the best cat trees currently on the market, to make your purchase decision a little easier. Go Pet Club has a really nicely designed cat tree which offers more than just something to scratch, but little compartments and areas they can relax too. We’ll take a look at its key features. Go Pet Club’s cat tree will keep your little feline friend occupied for hours! This club tree comes a tall 62 inches, giving them the option to enjoy a climb rather than on your furniture. The best feature about this cat tree is that it includes more than one activities for your cat. In fact, it features 4 different levels of fun for them to enjoy. The first level has a little hammock for them to relax in with ladders leading to the second level which has a small bed where they can hide. There is also a piece of natural sisal rope for them to scratch and sharpen their claws and another bed perched on the side. The 3rd level provides a flat base for them to reach up through a tunnel to the top level where they survey their territory. For many house cats who may not get as much exercise being out and about, this cat tree is the perfect solution to keep them mobile as they can climb up and down the 62-inch frame and keep active at the same time. This is also great for overweight cats and regular outdoor cats too. Not only does this cat tree help your cat to be more active, but it is likely to provide them with a lot of fun and exercise their muscles. This will also help kittens from chewing on your furniture so it is definitely a good investment in this sense. The next cat tree on our list is the Cat Activity Tree by Amazon Basics. This is another fun and engaging product which your cats are sure to fall in love with. We take a look at its special features in more detail below. Amazon Basics offer another exciting toy for cats, with their Cat Activity Tree. This cat tree is created for all sized cats, young or old and is bound to keep their attention for a good amount of time. 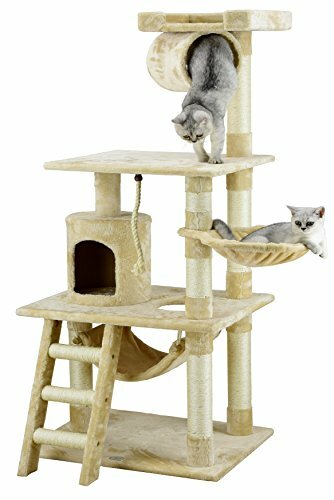 The three-tier design of this cat tree makes it a fun and challenging product for any cat, as they can easily climb and jump from one level to the next. It is also a perfect fit for any corner, so it doesn’t risk taking up too much space. There is also a cat bed on the top level where your cat can sleep if they like. One of the best features of this cat tree, and one which your cat is bound to love is the jute and carpet design which it comes with. The material allows a great surface for sharpening claws. This means your cat can sit for hours and scratch away until their heart is content, leaving your home carpet scratch free! Amazon Basics have made this product very easy to assemble, and it comes in a simple screw together design with all instructions and tools included. The final cat tree featuring on our list is the cat tree condo tower by Bewishome. This is a very well designed cat tree which has some nice features your cat is sure to enjoy. We take a look at the details below. Not as good for larger cats. The Bewishome Cat Tree Condo Tower is a special place your cat can call their own. With three levels and multiple platforms for sleeping or just resting, plus for scratching and stretching, this cat condo ticks all the boxes. The Bewishome cat tree is super stable and sturdy for all cats to enjoy. It features a solid construction composing of a well-balanced design and strong base. Cats can jump on and off with ease and should you have more than one cat using it at the same time, there is even a handy wall anchor strap which can be attached to the wall for a little extra stability. 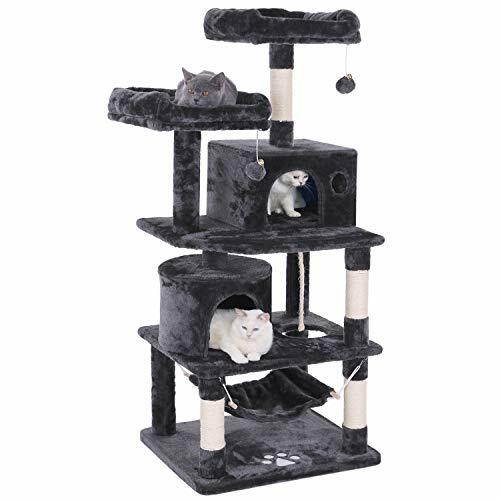 Your cats are sure to love the comfort of this cat tree as it is designed with quality plush covering on every level, so they can really enjoy it at the same time, especially when snuggled in the 2 hideaway beds which are included. Which is the Best Cat Tree For My Cat? All of the cat trees on our list are bound to be exciting for your cats to enjoy as each one provides a good-quality design, and features which will keep your cats occupied for a long time. If you are shopping on a budget, perhaps you will want to purchase a cheaper option. If this is the case, we recommend the Amazon Basics cat tree as this is the most inexpensive option. We hope that this article has inspired you to find a good cat tree for your furry friend!